ZAMRIE: Ashley Zygmunt's Emerging Fashion Label: Tommy Hilfiger Visits the Incubator! Mayor Richard M. Daley and Macy’s announced the appointment of Tommy Hilfiger as Master Designer for The Chicago Fashion Incubator at Macy’s on State Street. The Chicago Fashion Incubator, a joint venture of the City and Macy’s established in 2008, annually provides six emerging Chicago-based designers with the resources -- including workspace, curriculum and mentoring -- to launch their careers in fashion. Hilfiger’s participation was part of the larger announcement that Fashion Focus Chicago, a four-day celebration of Chicago’s thriving fashion industry, returns for a fifth year from Thursday, October 22 through Sunday, October 25. Fashion Focus Chicago showcases some of the city’s top designers and features runway shows in Millennium Park, shopping events, student designer events, and industry seminars. “Fashion Focus Chicago has established itself as a wonderful way to support the city’s fashion community, highlight the talented artists who live and work here and draw people to the neighborhood shops that sell fashions by local designers,” Daley said in a news conference held at Macy’s, 111 N. State St.
“The Incubator designers are lucky that such a major figure in the design world as Tommy Hilfiger is willing to share his knowledge and experience with them,” he said. As part of Mr. Hilfiger’s official role, he will serve as a mentor to the designers throughout their year of learning the fashion business. As an internationally acclaimed designer, he will be able to discuss key issues and offer concrete advice to the designers. 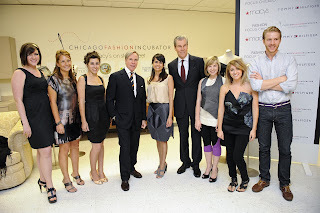 "Fashion is a fiercely competitive business, and through the Incubator, we enhance the opportunity for Chicago designers to succeed by nurturing and encouraging them,” said Terry J. Lundgren, Chairman, President and Chief Executive Officer of Macy's, Inc. “Macy's has a long history of supporting the City of Chicago’s Fashion Focus initiative and we are happy that through our relationship with Tommy Hilfiger we are able to engage him as Master Designer." Highlights for this year’s Fashion Focus Chicago include three headlining runway shows on Chase Promenade North in Chicago’s world-renowned Millennium Park and three independent designer runway shows at various locations across the city. The Millennium Park runway show line up includes Macy’s Designers of Chicago, Dress Code: The Chicago Design Schools Show, and Gen Art’s Fresh Faces in Fashion. The independent designer runway shows feature the lines of Michael Allen Stein, Organik Revolution, and Horacio Nieto. New this year is a partnership with Nolcha, a leading organization in promoting independent and emerging fashion talent from around the globe. Nolcha will be holding an Independent Retail Week in Chicago October 19 - 25 that will offer in-store events, sales, and luxe beauty treatments. Rounding out this year’s event are Fashion Focus-inspired Girlfriend Getaway shopping packages. Fashion Focus Chicago has partnered with theWit, The James, and the Essex Inn hotels to offer visitors an immersion in the Chicago fashion scene. The packages will include boutique excursions, signature cocktails, in-hotel events, reserved fashion show seats and VIP access, shuttle service and customized fashion itineraries. Daley pointed out that the contribution the fashion industry makes to improving the quality of life in Chicago has never been more important than right now, as the nation faces such difficult economic times. “I know this has been a very difficult year for designers, retailers and many others in this industry. Many are struggling simply to keep their business doors open. But we also recognize that these times set the stage for opportunity,” the mayor said. “As we re-focus our efforts to help people meet economic challenges, we lay plans to create our future. Fashion Focus 2009 builds on the successes of the past five years and moves us closer to our goal of helping this industry reach its maximum potential in our city,” he said. Gen Art Chicago, the Apparel Industry Board, Inc., Chicago Fashion Foundation, Columbia College Chicago, The Illinois Institute of Art – Chicago, the International Academy of Design and Technology, the School of the Art Institute and the Chicagoland Entrepreneurial Center. Chicago boasts more than 400 designers and 375 independent fashion boutiques. For more information, visit www.chicagofashionresource.com.